You can set up Intune to enroll iOS devices purchased through Apple's Device Enrollment Program (DEP). DEP lets you enroll large numbers of devices without ever touching them. Devices like iPhones and iPads can be shipped directly to users. When the user turns on the device, Setup Assistant runs with preconfigured settings and the device enrolls into management. 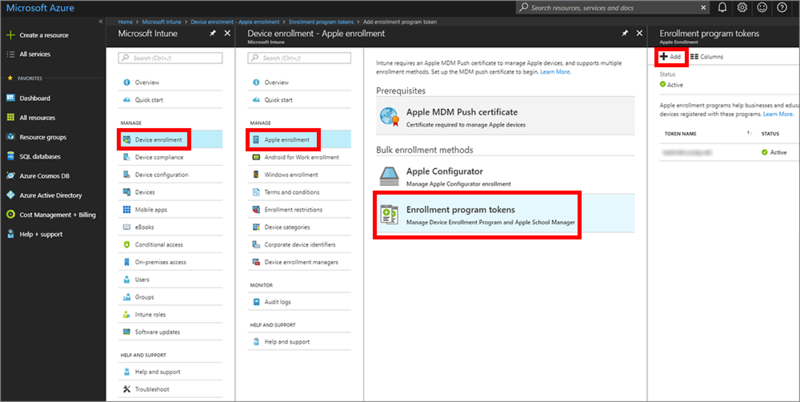 To enable DEP enrollment, you use both the Intune and Apple DEP portals. A list of serial numbers or a purchase order number is required so you can assign devices to Intune for management. You create DEP enrollment profiles containing settings that applied to devices during enrollment. By the way, DEP enrollment doesn't work with the device enrollment manager. Apple introduced supervised mode in iOS 5. An iOS device in supervised mode can be managed with more controls. As such, it's especially useful for corporate-owned devices. Intune supports configuring devices for supervised mode as part the Apple Device Enrollment Program (DEP). Support for unsupervised DEP devices was deprecated in iOS 11. In iOS 11 and later, DEP configured devices should always be supervised. The DEP is_supervised flag will be ignored in a future iOS release. Before you can enroll iOS devices with DEP, you need a DEP token (.p7m) file from Apple. This token lets Intune sync information about DEP devices that your corporation owns. It also permits Intune to upload enrollment profiles to Apple and to assign devices to those profiles. You use the Apple DEP portal to create a DEP token. You also use the DEP portal to assign devices to Intune for management. If you delete the token from the Intune classic portal before migrating to Azure, Intune might restore a deleted Apple DEP token. You can delete the DEP token again from the Azure portal. Step 1. Download the Intune public key certificate required to create the token. 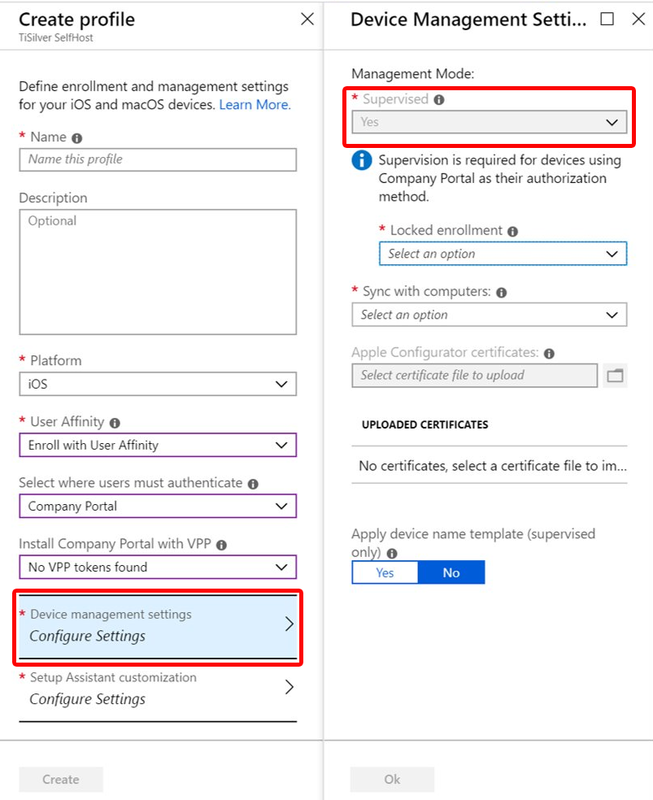 In Intune in the Azure portal, choose Device enrollment > Apple enrollment > Enrollment Program Tokens > Add. Grant permission to Microsoft to send user and device information to Apple by selecting I agree. Choose Download your public key to download and save the encryption key (.pem) file locally. The .pem file is used to request a trust-relationship certificate from the Apple Device Enrollment Program portal. Step 2. Use your key to download a token from Apple. Choose Create a token for Apple's Device Enrollment Program to open Apple's Deployment Program portal, and sign in with your company Apple ID. You can use this Apple ID to renew your DEP token. In Apple's Deployment Programs portal, choose Get Started for Device Enrollment Program. On the Manage Servers page, choose Add MDM Server. Enter the MDM Server Name, and then choose Next. The server name is for your reference to identify the mobile device management (MDM) server. It isn't the name or URL of the Microsoft Intune server. The Add <ServerName> dialog box opens, stating Upload Your Public Key. Select Choose File… to upload the .pem file, and then choose Next. Go to Deployment Programs > Device Enrollment Program > Manage Devices. For Choose Action, choose Assign to Server, choose the <ServerName> specified for Microsoft Intune, and then choose OK. 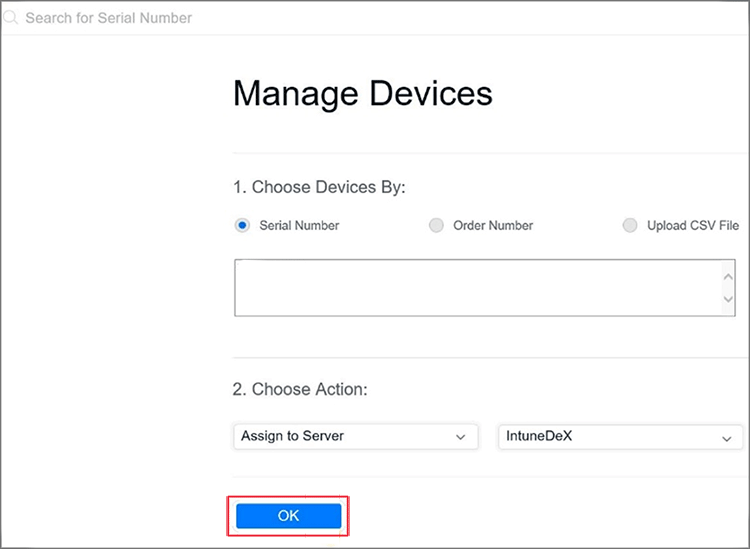 The Apple portal assigns the specified devices to the Intune server for management and then displays Assignment Complete. In the Apple portal, go to Deployment Programs > Device Enrollment Program > View Assignment History to see a list of devices and their MDM server assignment. Step 3. Save the Apple ID used to create this token. In Intune in the Azure portal, provide the Apple ID for future reference. Step 4. Upload your token and choose scope tags. In the Apple token box, browse to the certificate (.pem) file, choose Open. If you want to apply scope tags to this DEP token, choose Scope (tags), and select the scope tags that you want. Scope tags applied to a token will be inherited by profiles and devices added to this token. With the push certificate, Intune can enroll and manage iOS devices by pushing policy to enrolled mobile devices. Intune automatically synchronizes with Apple to see your enrollment program account. Now that you've installed your token, you can create an enrollment profile for DEP devices. 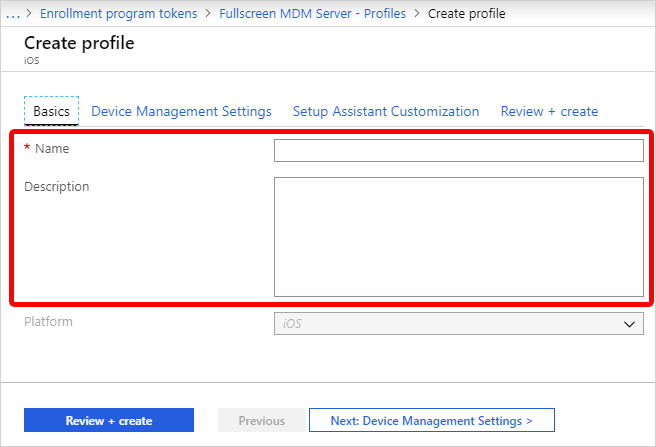 A device enrollment profile defines the settings applied to a group of devices during enrollment. Devices will be blocked if there are not enough Company Portal licenses for a VPP token, or if the token has expired. Intune will display an alert when a token is about to expire or licenses are running low. In Intune in the Azure portal, choose Device enrollment > Apple Enrollment > Enrollment program tokens. Select a token, choose Profiles, and then choose Create profile. Under Create Profile, enter a Name and Description for the profile for administrative purposes. Users don't see these details. You can use this Name field to create a dynamic group in Azure Active Directory. Use the profile name to define the enrollmentProfileName parameter to assign devices with this enrollment profile. Learn more about Azure Active Directory dynamic groups. For User Affinity, choose whether devices with this profile must enroll with or without an assigned user. Enroll with User Affinity - Choose this option for devices that belong to users and that want to use the Company Portal for services like installing apps. If using ADFS and the enrollment profile has Authenticate with Company Portal instead of Setup Assistant set to No, WS-Trust 1.3 Username/Mixed endpoint Learn more is required. Enroll without User Affinity - Choose this option for device unaffiliated with a single user. Use this option for devices that perform tasks without accessing local user data. Apps like the Company Portal app don’t work. If you chose Enroll with User Affinity, you can let users authenticate with Company Portal instead of the Apple Setup Assistant. If you want do any of the following, set Authenticate with Company Portal instead of Apple Setup Assistant to Yes. These are not supported when authenticating with Apple Setup Assistant. If you chose Yes for Authenticate with Company Portal instead of Apple Setup Assistant, you can use a Volume Purchase Program (VPP) token to automatically install the Company Portal on the device. In this case, the user doesn't have to supply an Apple ID. To install the Company Portal with a VPP token, choose a token under Install Company Portal with VPP. Make sure that the token doesn't expire and that you have enough device licenses for the Company Portal app. If the token expires or runs out of licenses, Intune installs the App Store Company Portal instead and prompts for an Apple ID. If you chose a token for Install Company Portal with VPP, you can lock the device in Single App Mode (specifically, the Company Portal app) right after the Setup Assistant completes. Choose Yes for Run Company Portal in Single App Mode until authentication to set this option. To use the device, the user must first authenticate by signing in using the Company Portal. This feature is only supported for iOS 11.3.1 and later. Choose Device Management Settings and choose if you want devices using this profile to be supervised. Supervised devices give you more management options and disabled Activation Lock by default. Microsoft recommends using DEP as the mechanism for enabling supervised mode, especially if you're deploying large numbers of iOS devices. The lock screen says: "This iPhone is managed by Contoso." The Settings > General > About screen says: "This iPhone is supervised. Contoso can monitor your Internet traffic and locate this device." A device enrolled without supervision can only be reset to supervised by using the Apple Configurator. Resetting the device in this manner requires connecting an iOS device to a Mac with a USB cable. Learn more about this on Apple Configurator docs. Choose if you want locked enrollment for devices using this profile. Locked enrollment disables iOS settings that allow the management profile to be removed from the Settings menu. After device enrollment, you can't change this setting without wiping the device. Such devices must have the Supervised Management Mode set to Yes. Choose if you want the devices using this profile to be able to Sync with computers. If you choose Allow Apple Configurator by certificate, you must choose a certificate under Apple Configurator Certificates. If you chose Allow Apple Configurator by certificate in the previous step, choose an Apple Configurator Certificate to import. You can specify a naming format for devices that is automatically applied when they enroll. To create a naming template, select Yes under Apply device name template. Then, in the Device Name Template box, enter the template to use for the names using this profile. You can specify a template format that includes the device type and serial number. Department Name Appears when users tap About Configuration during activation. Department Phone Appears when the user clicks the Need Help button during activation. You can choose to hide Setup Assistant screens on the device during user setup. If you choose Hide, the screen won't be displayed during setup. After setting up the device, the user can still go in to the Settings menu to set up the feature. If you choose Show, the screen will be displayed during setup. The user can sometimes skip the screen without taking action. But they can then later go into the device's Settings menu to set up the feature. Passcode Prompt the user for a passcode. Always require a passcode for unsecured devices unless access is controlled in some other manner (like kiosk mode that restricts the device to one app). Location Services Prompt the user for their location. Restore Display the Apps & Data screen. This screen gives the user the option to restore or transfer data from iCloud Backup when they set up the device. iCloud and Apple ID Give the user the options to sign in with their Apple ID and use iCloud. Terms and Conditions Require the user to accept Apple's terms and conditions. Touch ID Give the user the option to set up fingerprint identification for the device. Apple Pay Give the user the option to set up Apple Pay on the device. Zoom Give the user to the option to zoom the display when they set up the device. Siri Give the user the option to set up Siri. Diagnostic Data Display the Diagnostics screen to the user. This screen gives the user the option to send diagnostic data to Apple. Display Tone Give the user the option to turn on Display Tone. Privacy Display the Privacy screen to the user. Android Migration Give the user the option to migrate date from an Android device. iMessage and FaceTime Give the user the option to set up iMessage and FaceTime. Onboarding Display onboarding informational screens for user education, such as Cover Sheet and Multitasking and Control Center. Watch Migration Give the user the option to migrate data from a watch device. Screen Time Display the Screen Time screen. Software Update Display the mandatory software update screen. SIM Setup Give the user the option to add a cellular plan. To save the profile, choose Create. Now that Intune has permission to manage your devices, you can synchronize Intune with Apple to see your managed devices in Intune in the Azure portal. 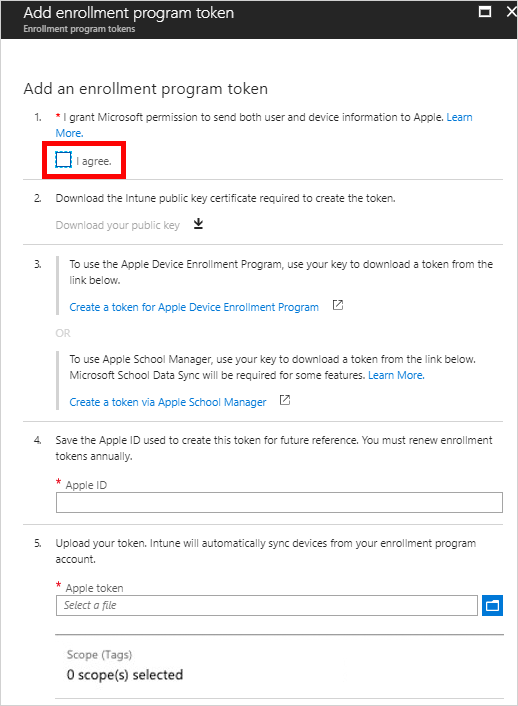 In Intune in the Azure portal, choose Device enrollment > Apple Enrollment > Enrollment program tokens > choose a token in the list > Devices > Sync. A full sync can run no more than once every seven days. 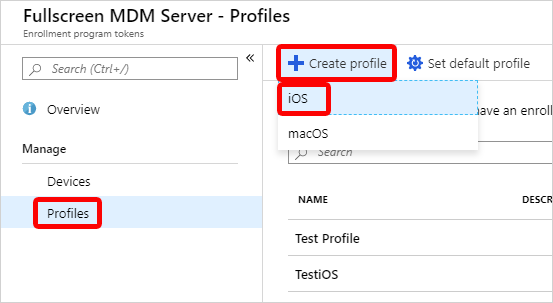 During a full sync, Intune fetches the complete updated list of serial numbers assigned to the Apple MDM server connected to Intune. If a DEP device is deleted from the Intune portal, it should be unassigned from the Apple MDM server in the DEP portal. If it's not unassigned, it won't be reimported to Intune until the full sync is run. A sync is run automatically every 24 hours. You can also sync by clicking the Sync button (no more than once every 15 minutes). All sync requests are given 15 minutes to finish. The Sync button is disabled until a sync is completed. This sync will refresh existing device status and import new devices assigned to the Apple MDM server. You must assign an enrollment program profile to devices before they can enroll. You can also assign serial numbers to profiles from the Apple Serial Numbers blade. 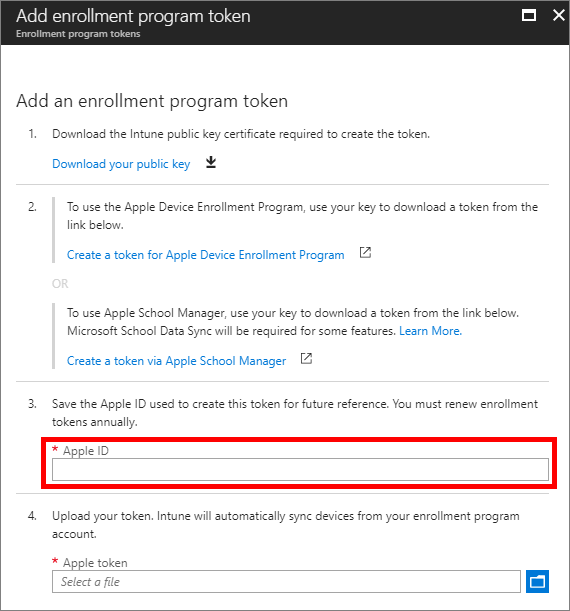 In Intune in the Azure portal, choose Device enrollment > Apple Enrollment > Enrollment program tokens > choose a token in the list. Choose Devices > choose devices in the list > Assign profile. Under Assign profile, choose a profile for the devices > Assign. You can pick a default profile to be applied to all devices enrolling with a specific token. Choose Set Default Profile, choose a profile in the drop-down list, and then choose Save. This profile will be applied to all devices that enroll with the token. 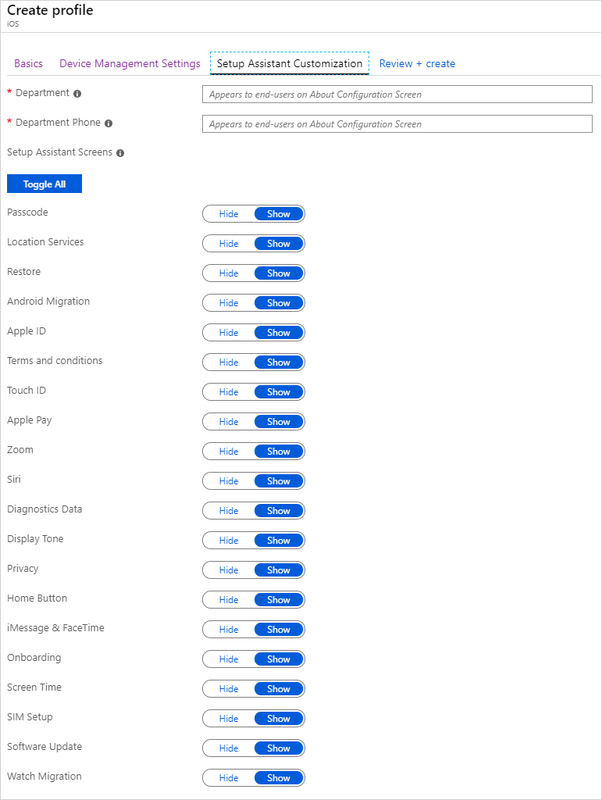 You have enabled management and syncing between Apple and Intune, and assigned a profile to let your DEP devices enroll. You can now distribute devices to users. Devices with user affinity require each user be assigned an Intune license. Devices without user affinity require a device license. An activated device can't apply an enrollment profile until the device is wiped. See Enroll your iOS device in Intune with the Device Enrollment Program. 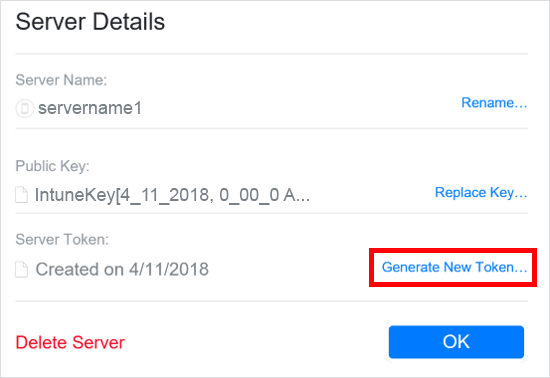 Under Manage Servers, choose your MDM server associated with the token file that you want to renew. 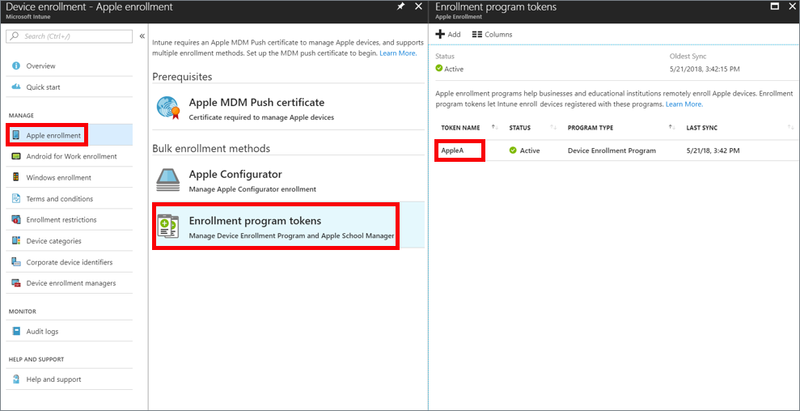 In Intune in the Azure portal, choose Device enrollment > Apple Enrollment > Enrollment program tokens > choose the token. Choose Renew token and enter the Apple ID used to create the original token. Upload the newly downloaded token. Choose Renew token. You'll see the confirmation that the token was renewed.